Today is the UN’s first International Day of the Girl. It is a day to bring to light the fact that millions of girls continue to bear the weight of poverty and discrimination - being married and traded by their families as they struggle to survive. World Vision want to mark the first International Day of the Girl by calling loud and clear that the world must unite and take action to end child marriage. By coming together on facebook, twitter and blogs for International Day of the Girl they want to create a moment of solidarity – woman to woman, girl to girl, mother to child - to say that this is unacceptable and this must end. This is Amira. One day she came home from school to learn that her mother and grandmother had accepted a wedding request to a boy that she didn’t know and had never met. “My mother told me that she was to marry me off. I couldn’t believe my ears. I burst into loud cry and my eyes were filled with tears. I begged her kneeling down to cancel the marriage, but she said no and insisted me to go straight to the elders, bow down and kiss the elders’ knees,” she recalls. “I hopelessly wrote a letter to my teacher who is working on early marriage. In my letter I asked her to go and inform the police to take me out of this danger,” she said. Amira’s teacher, Dejiytinu, is the head of the early marriage club of the school and head for the village women affairs. Through receiving this training from World Vision, she brought 14 early arranged marriages to the court out of which she successfully cancelled eleven of them. “As soon as I read the letter, I went to the police station and applied for help. The policemen went to the home of the child and told the grandmother to cancel the marriage otherwise they would face legal imprisonment,” Dejiytinu said. 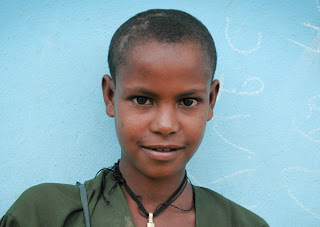 Amira is now happy and attending school, wanting to become a doctor. However she still has a an escape plan should her family want to marry her again. “I would disappear from his sight to a remote place and continue my education at evening school, working as a daily labourer in day time,” Amira says. Unfortunately not all stories end so happily. Write about child marriage on your blog in honour of #dayofthegirl, asking your readers to add their voice or sponsor a girl to help put an end to child marriage. Tweet us at @WorldVisionPR or @KaylaERobertson to let us know. Sponsoring a girl provides girls and their communities with education and support to empower them to take a stand against child marriage.